Mary-Ann with you today, sharing my card with So Many Places and Perfect Sentiment Stamps Sets. Both are on sale and are 50% off on our website! 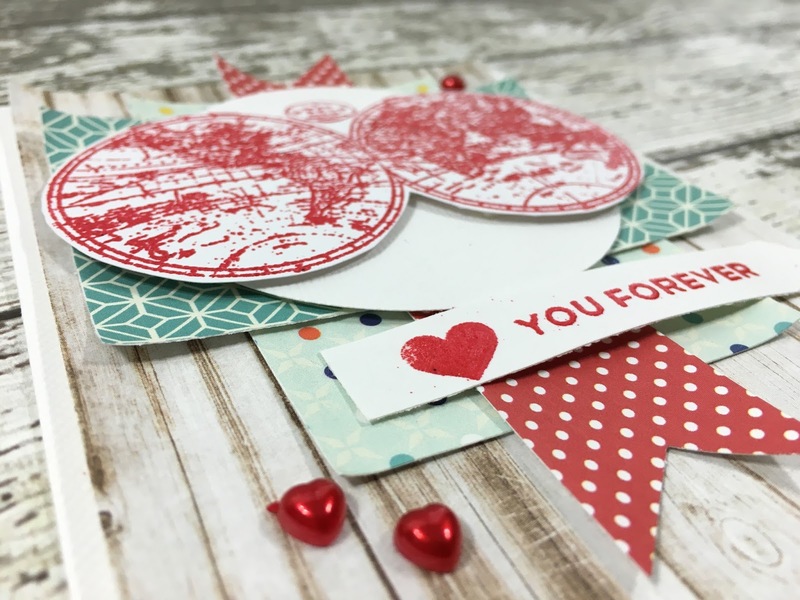 There are several other Clear stamps sets, Red Rubber Stamp Sets, all Gelatos, and a buy 3 get the 4th on You're So Fine Glitter! 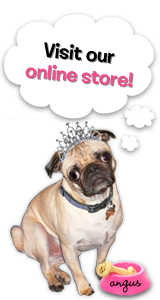 Go HERE to check out all the different items on sale. 1. Start with a A2 card base (5 1/2 x 4 1/4). I used Fancy Pants Nautical paper line. You can use anything. 2. Apply a light colored 5 1/4 x 4 paper. 3. Add a 3 3/4 x 2 1/2 piece of paper long way. 4. Add a 3 3/4 x 2 1/2 piece of another pattern sideways. 5. Now add a bright paper (I used red) 1 x 5 with notches out of each end. 6. I added a 3" circle backed with foam. 7. 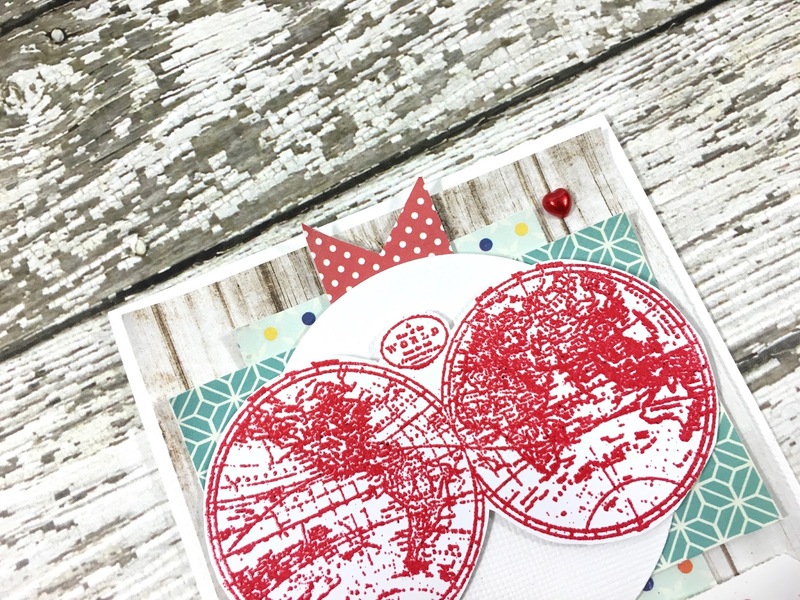 Stamp and heat emboss the globe with red embossing powder and fussy cut. Add with foam tape. 8. Stamp and emboss the sentiment, added with foam. 9. Add red heart pearls. Her you can see how foam tape adds dimension. You can opt out of foam if you are going to mail this card. Don't for get to stop by the STORE to take advantage of the very generous SALE! I am back with another tutorial using stamps from The Rubber Cafe'. 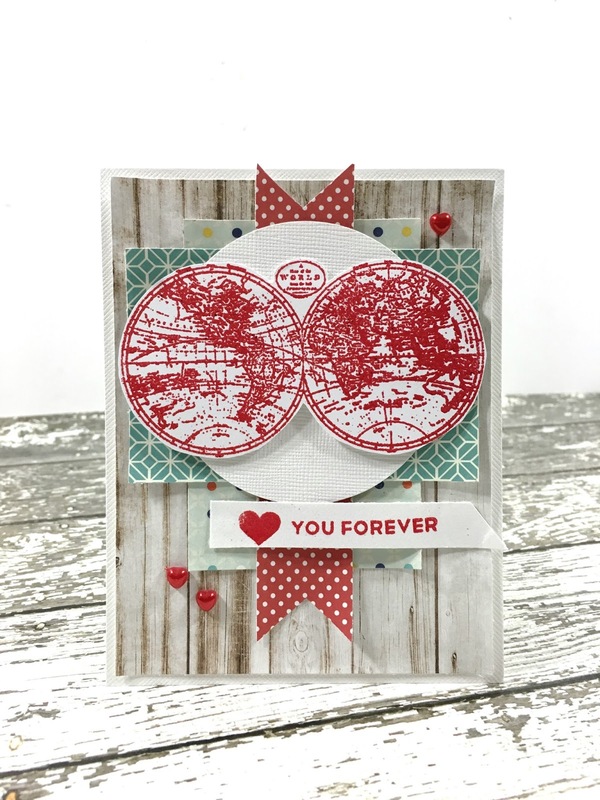 We will be back next month with card samples from our monthly card kit but until the card kits start again the design team ladies are sharing cards that we created using stamps from past kits that are currently on sale at 50% off! This image is from the Grand Adventure Clear Stamp Set. This was a pretty simple card to create. I started with a 4" x 5 1/4" panel of red cardstock. Then I added a strip of Queen & Co. Washi Tape. I stamped the scooter image with Memento Black Tuxedo Ink on white cardstock and trimmed closely around the image. The image was colored with Tombow USA colored pencils. I backed the panel with a slightly larger red panel and then a slightly larger black panel. I added three heart embellishments from Queen & Co.
Paper: Bazzil Cardstock, plaid patterned paper from my stash but you could use any patterned paper that you have in your stash! When Life Gives You Lemons.....Get Crafty!! Hello everyone! 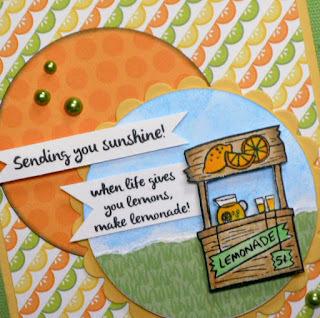 I've got a little sweet sunshine, with a lemony twist for you today! 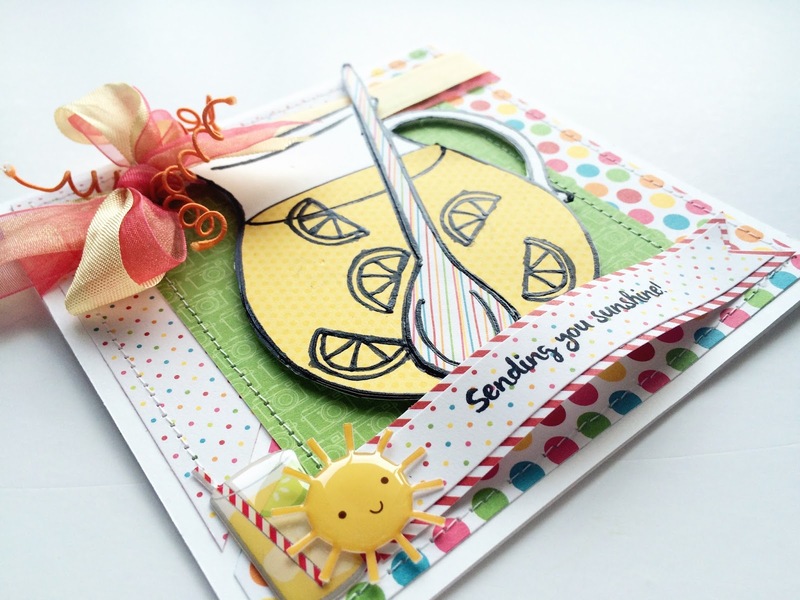 This card starts with a basic A2 size base (5&1/2 by 4&1/4) of yellow cardstock. 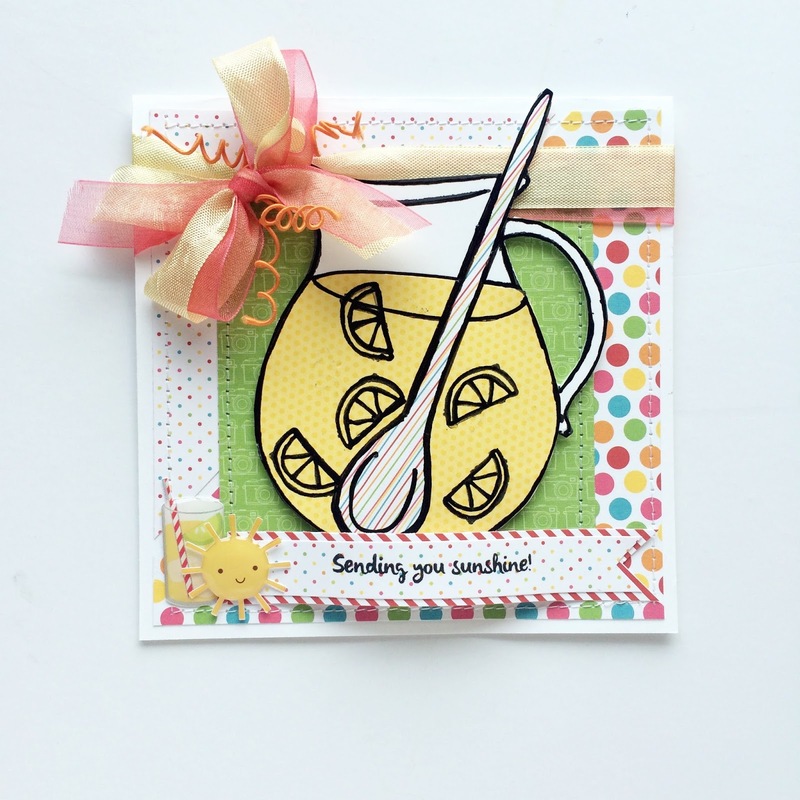 I added a 5&1/4" by 4" layer of citrus slice patterned paper. I cut a 2&7/8" circle out of orange dot paper and white cardstock. I brushed ink around the edge of the orange circle and glued it to the upper left of the card front. The white circle I sponged on blue ink to create a sky. Then I tore the edge off of a 1&1/4" strip of green grass paper and glued it to the circle using Scrap Happy Glue. I trimmed the edges off to match the circle. Next, was die cutting the scallop circle out of yellow cardstock and foam tape the sky/grass background to this piece, then glue to the card overlapping the orange circle. Stamp the sentiments on white cardstock in Black Tuxedo Memento Ink and trim down to banners. Stamp the lemonade stand, color, and fussy cut. Foam tape stand to the right side of sky/grass background, add banners and pearl to finish. This is a fun sunny card to encourage a friend! Glad you could stop by today.....make sure to check out the BIG SALE on The Rubber Cafe' website! Hi there! You didn't REALLY think I was done playing with slider cards, did you? 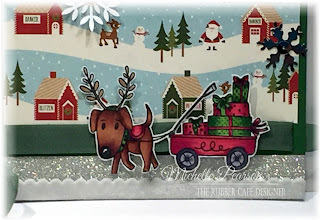 I promise to have something else for my next card....but how stinkin' cute is this with the reindeer dragging his feet? This is the Christmas is Coming clear set. I stamped the image on white cardstock and then fussy cut it, leaving a narrow white border. I again used papers from the Echo Park The Story Of Christmas 6x6 pad. I based the card on a piece of green cardstock measuring 4 1/4 x 5 1/2 inches. The banner strip measures 5 1/4 x 1 1/8 inches. The candy stripe paper measures 5 1/4 x 3 inches. 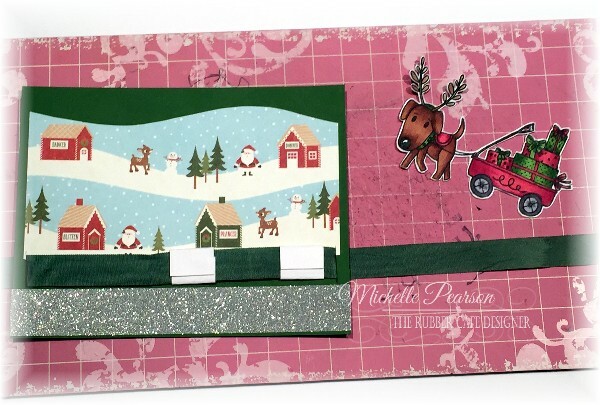 I cut my parallel horizontal slits 4 7/8 inches long, 1 1/2 inches from the bottom of the card and 1 7/8 inches from the bottom of the card. My vertical slits are 3/4 inch long and are cut 1/8 beyond the ends of the parallel slits. I wove the ends of my 18 inches of seam binding through the slits towards the back of the card, over my horizontal slits. I tied knots on the ends of my ribbon and then added some Doodlebug charms to the end for a fun, festive touch. 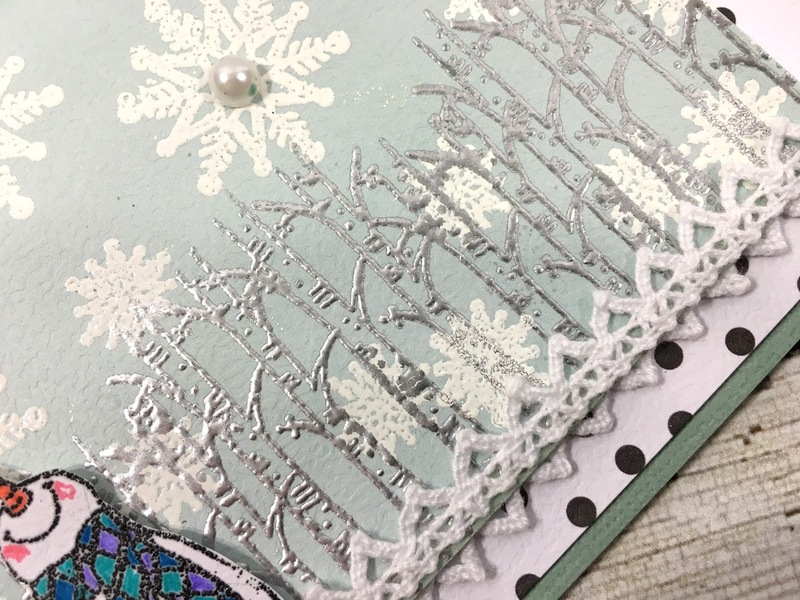 To finish the bottom of my card I ran a strip of 1/2 x 5 1/2 inch Scor-tape and covered it with You're So Fine Silver Medal Glitter . I added some velvet trim to the bottom for an additional snowy touch. 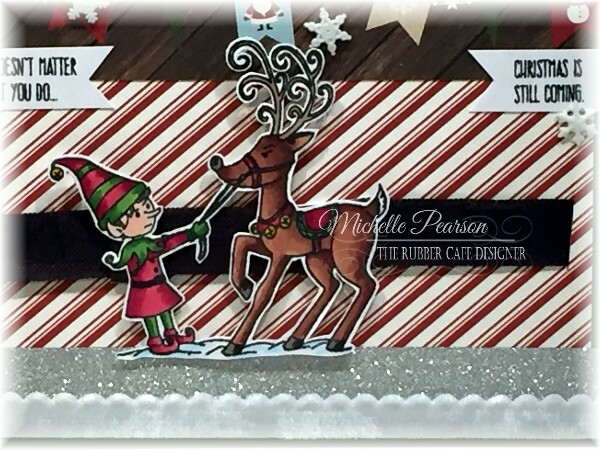 Again, for this card I made two little paper loops to attach to the ribbon behind the elf and the reindeer to give the slider more stability. I added two little sentiment banners and a few misc. snowflake button elements I found in my stash. Hello TRC Friends! All this month the design team has been showcasing stamp sets that are ON SALE on The Rubber Cafe' website. These stamp sets are from some of the past Creative Cafe' kits. So if you are a subscriber to the Creative Cafe' Kit club, you already have these wonderful stamps. But if you don't have these stamp sets, now is the time to grab them for a great price. You can check out all the stamp sets currently on sale HERE. Thanks for stopping by today. I hope you will check out all the great items on sale so you can pick up some bargains for yourself! 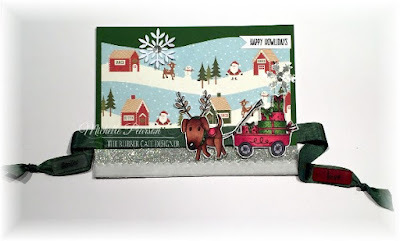 These tags were completed using the October Creative Cafe' kit - Creative Christmas. Which is currently ON SALE! The other day I sat down at my desk and it was a disaster. As I was cleaning it up and putting things away, I set aside things I had colored and die cut. By the time I was done I had quite a pile of stuff. Using some tags I cut out with my Silhouette, I made these quick and easy tags that will be perfect on a Christmas gift. 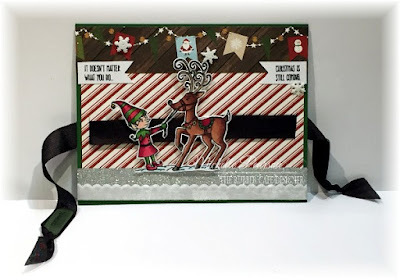 Kristine back with my Sunday tutorial using stamps from the Rubber Cafe'. 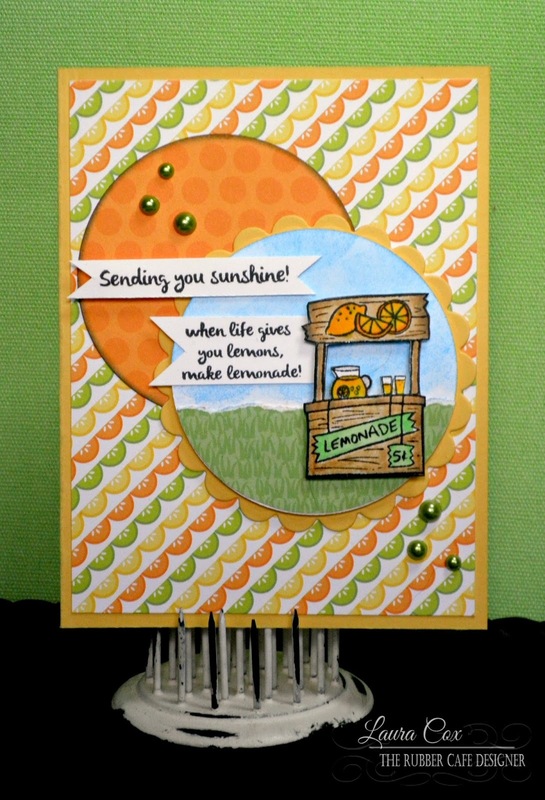 This image is from the Lemonade Stand clear stamp set. 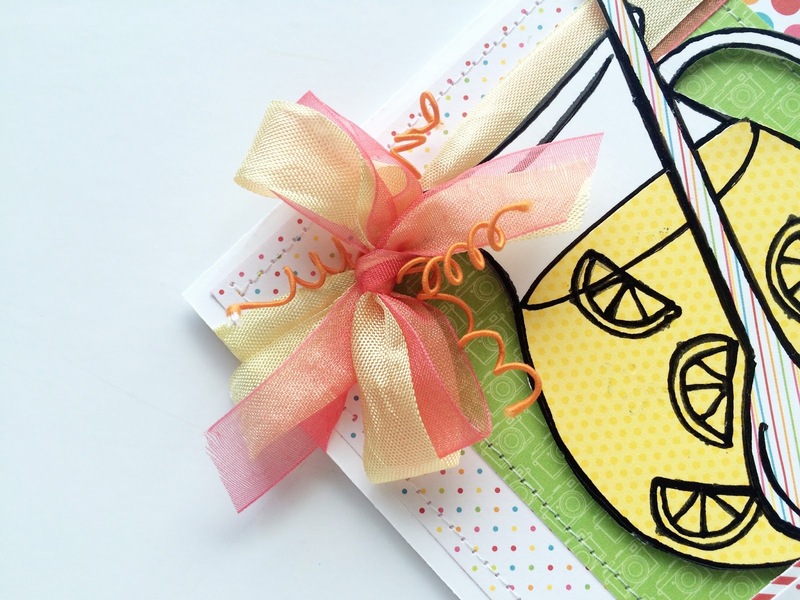 To create this fun zig zag card I started with a 5 1/2" x 11" piece of white cardstock. I used my Scor-Pal to score the cardstock. I scored it at 1 1/2" 3" 5 1/4" and 7 1/4"
Then I folded it on the score lines "valley/Mountain" style as shown. I added patterned paper to the panels with Scrap Happy Glue. Starting from the left, the first two panels are 5 1/4" x 1 1/4" each. The flowered panel is 5 1/4" x 2". The yellow panel is 5 1/4" x 1 3/4". The last panel is 5 1/4" x 3". The paper is all from Doodlebug. When the card is fold back up it looks like this and measures 5 1/2" x 4 1/4". I tied a ribbon around the first panel. 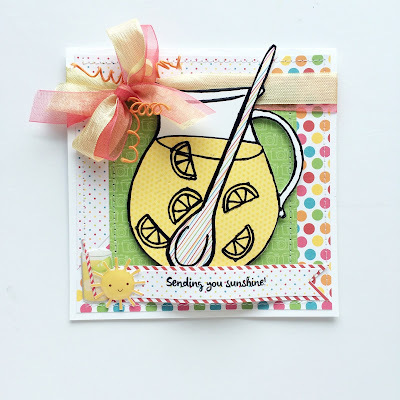 I stamped the lemonade pitcher and sentiment on a white panel and colored the image with colored pencils. When the card is folded up it looks like this. Such a great fun fold card! This is such a fun set and is such a great price right now. I hope you enjoyed this tutorial and will give it a try. Are you ready for more inspiration using our SALE stamps? 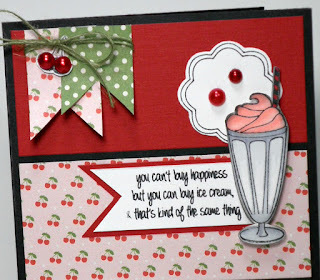 I am sharing another bonus inspiration card with you today! I love this super cute Always Room for Ice Cream set! Maybe I love it more because it is on SALE in the store. Go HERE to grab it! Base: 5&1/2" by 4&1/4" black cardstock. First Layer: 5&1/4" by 4" piece of red cardstock glue to the black cardstock base using Scrap Happy Glue. Center Panel: 3" by 4" piece of cherry pattern paper matted on 3&1/4" by 4&1/4" piece of black cardstock. Glue to front of card. 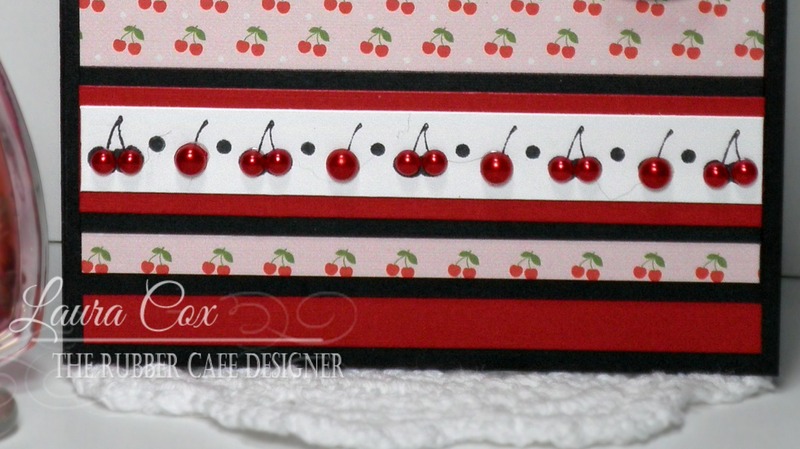 Stamp row of cherries in Memento Black Tuxedo ink, mat on red cardstock 3/4" by 4" and then mat on black cardstock 1" by 4". Glue red pearls to cherries, and glue strip onto card. Stamp scallop circle, sentiment and milkshake in Black Tuxedo ink on white cardstock. Color in milkshake. 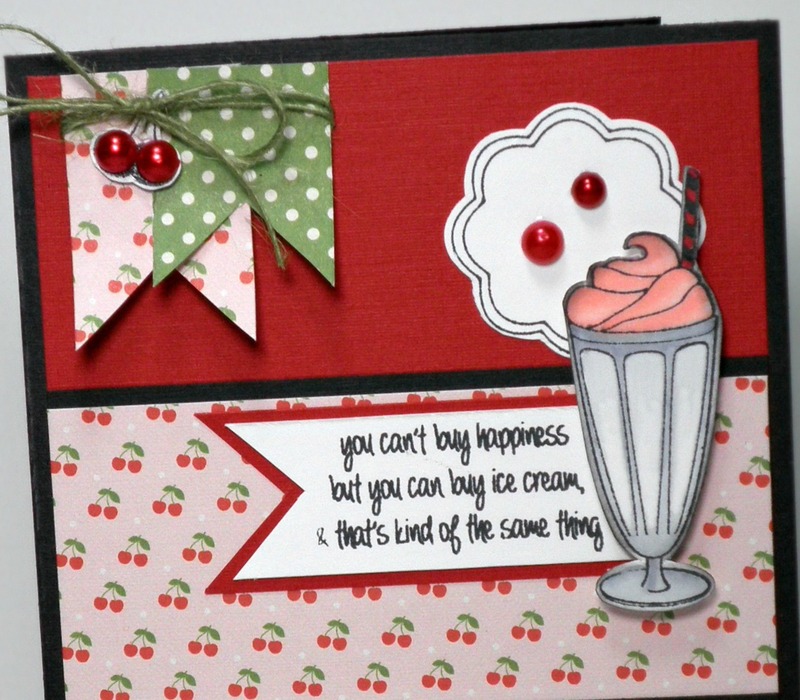 Fussy cut out scallop, milkshake, and cut out sentiment (about 2&1/2" by 1"), trim to a banner shape, and mat on red cardstock. 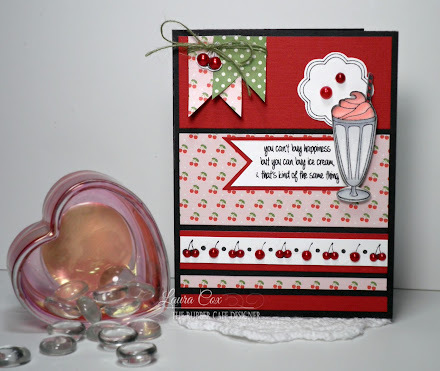 Glue circle and sentiment to card, add milkshake using foam tape. Cut banners for the top left of card, wrap with hemp twine, stamp cherries, add pearls, and add to twine with a bow. Stop back soon....more inspiration coming your way soon! Hearts of the Season Clear Set. I stamped the image with Memento Tuxedo Black Ink on white cardstock and colored the image with Copic Markers. I fussy cut the image, leaving a narrow white border around it . I used paper from the Echo Park The Story of Christmas 6x6 paper pad and cut along the snow line to create a scene as shown. I attached the 5 1/4 x 3 inch piece of patterned paper to a green cardstock panel measuring 5 1/2 x 4 1/4 inches. To create my slider I cut two parallel slits 5 inches long that are 7/8 inches from the bottom of the cardstock and 3/8 inches apart. Then, at the end of the 5 inch slits, cut a perpendicular slit 1/8 inch from the ends that is 5/8 inch long on each end of the card. Insert 18 inches of green seam binding through the slits towards the back of the panel as shown. To make this ribbon slider more sturdy I made to little loops with the white cardstock scraps, one to put behind the rein-dog and one for behind the wagon/sleigh. Tuck the loop under the parallel slits that you cut and around the ribbon and attach to the ribbon with ScorTape as shown. Make sure you adjust them so that there is one hidden behind each half of the image. Attach your image to your ribbon slides with ScorTape. 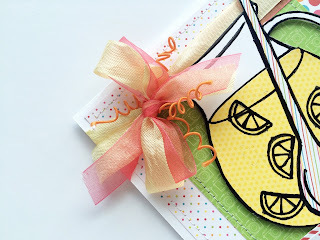 I used embellishments from a Doodlebug embellishment kit to decorate my ribbon which I tied a knot in each end. A few sequins and snowflake punches add some snow detailing. I created a tiny banner with a sentiment from the set as shown. Finally to add a bit more sparkle and fun I cut a strip of Scor-Tape that is 1/2 inch wide and covered it with You're So Fine Silver Medal Glitter. 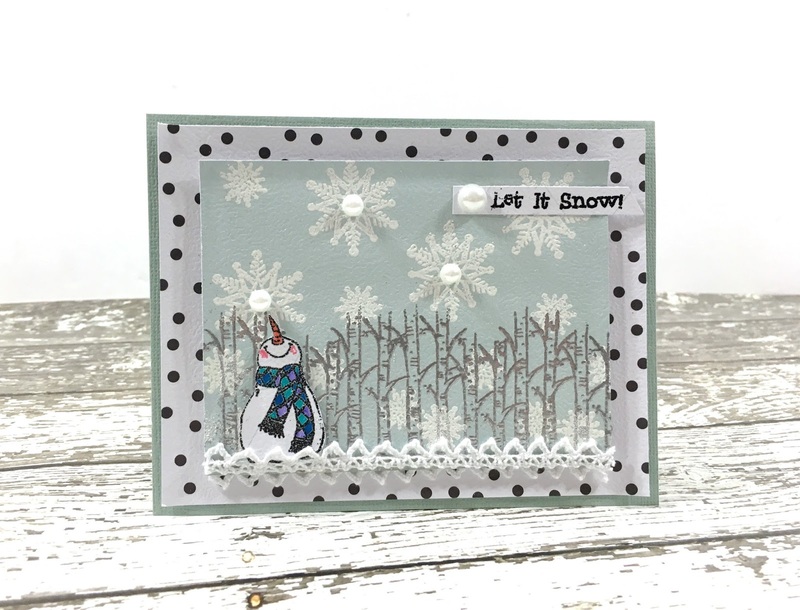 I topped it with a piece of white flocked ribbon to mimic snow. You can attach this panel to an A2 folded card, just remember not to put adhesive where the ribbon needs to sneek through so that your ribbon slider works!! I hope you have enjoyed my second ribbon slider card. You'll have to wait until next week to see if I am done with the spree just yet!